This disease has been called Ophiobolus patch or Gaeumannomyces patch. Only bentgrasses are susceptible, so it is seen most commonly on golf course greens and fairways, where it can cause serious turf losses. 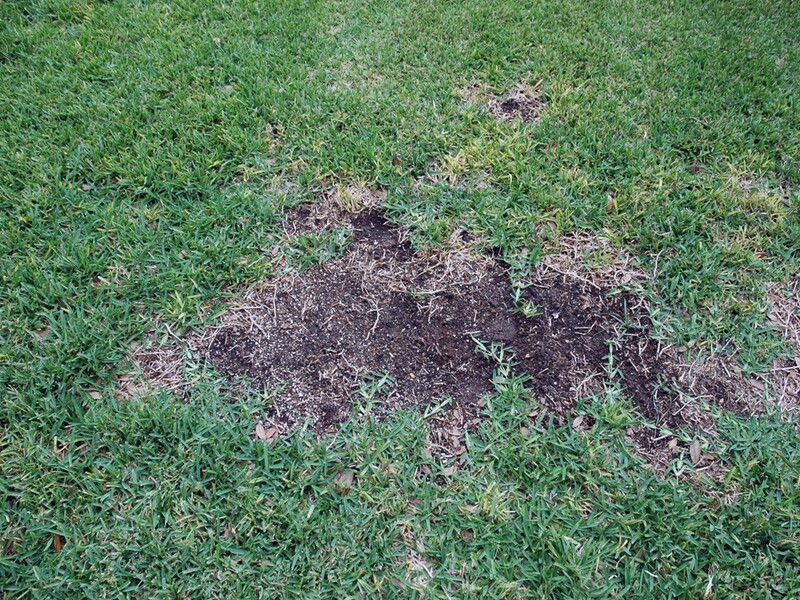 Take-all patch usually appears in the late spring or early summer as reddish-brown or yellow areas of dead grass. 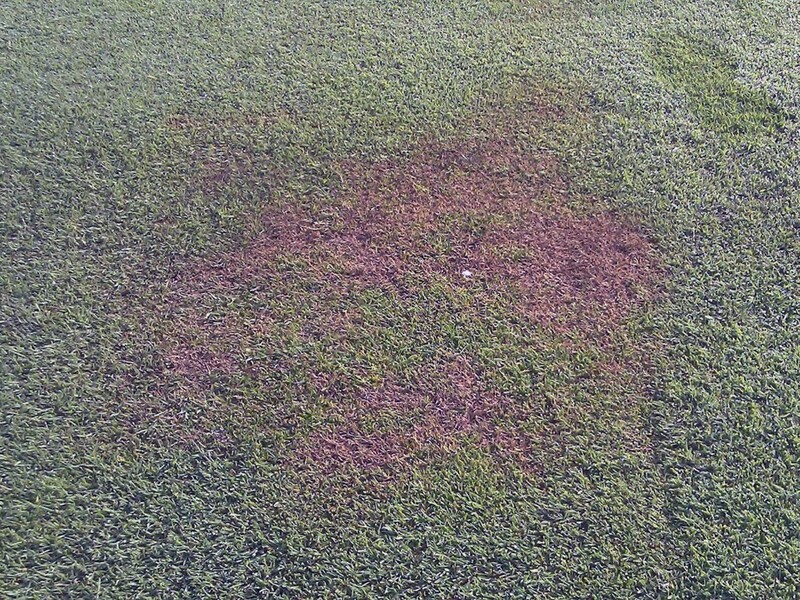 Infection centers appear as rings, crescents, or spots in pure bentgrass stands. The center of the patch often is invaded by annual bluegrass or other weeds. In mixed stands of turf, the bentgrass is killed and other grasses in the stand remain. Affected areas may enlarge as much as 150mm or more in a year and eventually will exceed 1 meter. 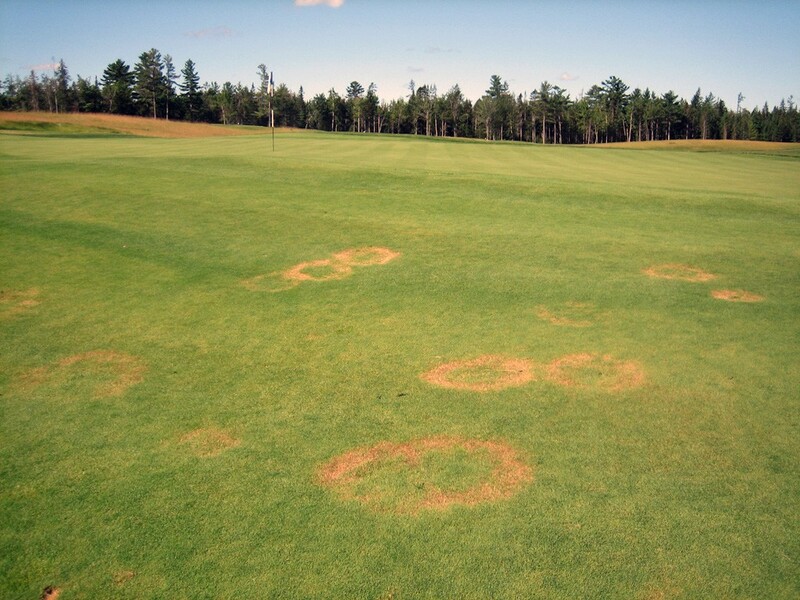 The symptoms become most conspicuous after turf has been stressed from hot, dry weather, even though moist, cool conditions favor infection and growth of the causal fungus. Dead or dying roots may be covered with dark brown strands of fungus (runner hyphae), and dark brown to black mats of fungal growth may be present on the stem bases beneath the leaf sheaths and on the crowns and roots of the killed tillers. Take-all patch is most frequently observed on bentgrass planted in recently fumigated soils and/or in recently cleared forested or wetland areas. In these situations, the beneficial microorganisms that compete with or antagonize Gaeumannomyces are present in low populations. In most cases, the disease will decline over a period of 4 or 5 years, a phenomenon thought to be associated with the build-up of antagonistic microorganisms. The causal fungus grows on the surface of bentgrass roots and attacks the roots in cool, wet weather, although the symptoms do not appear until warm, sunny weather occurs. Since disease damage is, time-wise, removed from the symptoms, it is important to implement control measures prior to symptom development. Bentgrass take-all is most serious in soils with pH above 6.0. In some cases, liming appears to stimulate the fungus. At present, the only effective control known for bentgrass take-all patch is the use of some form of sulfur or an acidifying fertilizer such as ammonium sulfate or ammonium chloride. Ammonium sulfate should be applied and watered-in two to four times yearly, in spring and fall. Some of the broad-spectrum systemic fungicides may control this disease if applications are timed to prevent fungal invasion of bentgrass plants in cool, wet environments. However, results obtained from fungicide applications are erratic and rarely give complete control.